This recipe was recently the recipe of the day on Nigella.com (it is from How to Be a Domestic Goddess, one of my favourite baking books) and a few days later Marks & Spencer had an offer on passion fruits. So I decided to give this a go. I have never made any sort of a curd before so I wasn’t sure what to expect. I read a few more recipes online to get a feeling of what is the norm and what methods are used. This was nearly the only recipe that de-seeded the pulp and I decided to stick with that to give the curd a smoother texture. The problem that I ran into was that it just wouldn’t seem to thicken. Nigella’s recipe calls for heating it in a heavy based pan and stirring gently until thickened. I did this for more than half an hour and wasn’t getting anywhere. And it still tasted a bit eggy. I jarred it and put it into the fridge for a bit. Then I thought I’d try heating it in a bain marie, as is the cooking method in most of the other recipes. It then thickened very quickly and was really gorgeous. Maybe it just needed extra time in the pan but I think next time I’ll just go straight with the bain marie. Put the seeded pulp of 10 of the passion fruit into a food processor and blitz for a couple of minutes just to loosen the seeds. Strain into a jug or bowl. Make sure to push the juice through with a spoon so that you get every last drop of juice from the pulp. Place a heatproof bowl over a pot of simmering water – make sure the water does not touch the bottom of the bowl (this is your bain marie). 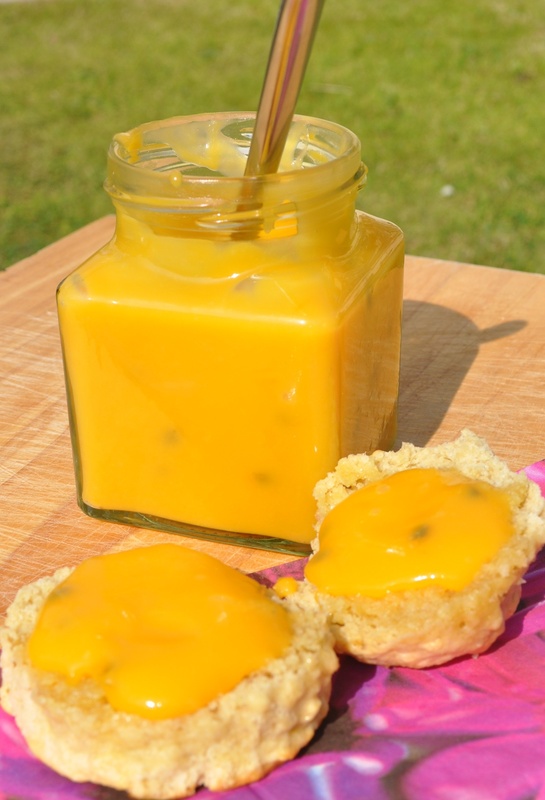 Melt the butter in this bowl, and when melted stir in the sugar-egg mixture and the passion fruit juice, and keep cooking gently, stirring constantly, until thickened. 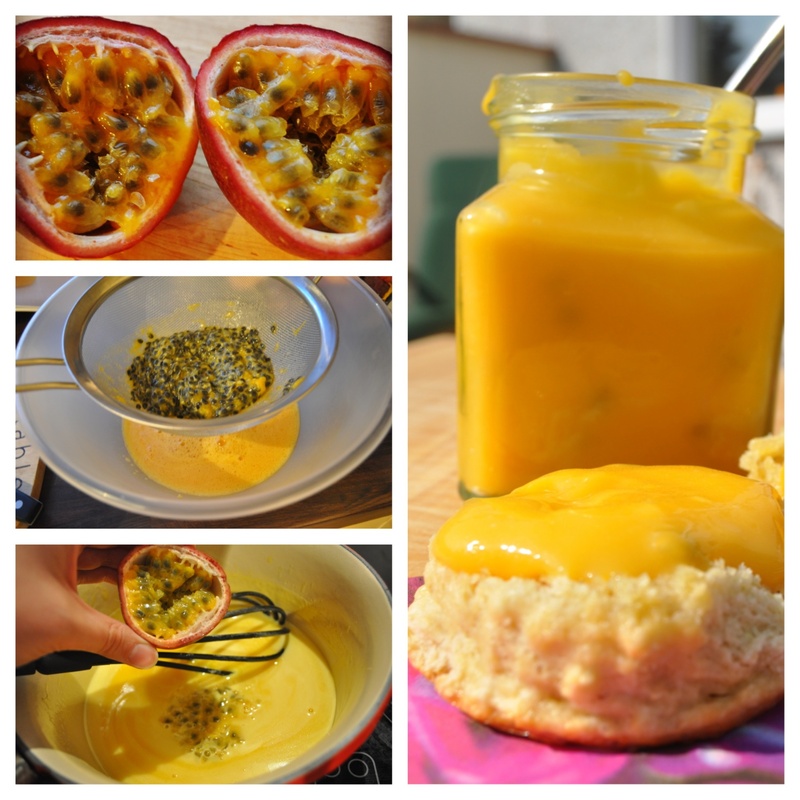 Off the heat, whisk in the pulp – seeds and all – of the remaining passion fruit, let cool slightly, then pour into a 350ml / 1½ cup jar. Keep in the fridge. This curd is quite tangy and not for everyone, but I love it and it can be used in so many ways – if you don’t just eat it straight from the jar! I had it instead of jam on buttermilk scones. I also smeared it along the top of a (shop bought) baked vanilla cheesecake and it was gorgeous. You could pour over meringues and cream. Next time I think I’ll try the Passion fruit curd, lime, meringue & raspberry tart from Paula’s Kitchen Table.